So what of Microgaming’s Power Poker? Will it karate chop us to the floor with its excellence? Well, the Deuces are Wild…It mightn’t karate chop us, but it is sure to give us a Quickfire hit of superfast poker play. Our ultimate aim is to land the 25,000.00 jackpot, though the real beauty of this five card draw variant is that we don’t have to face down any steely opponents and pretend we haven’t got a decent hand. We can go as Wild as the Deuces. 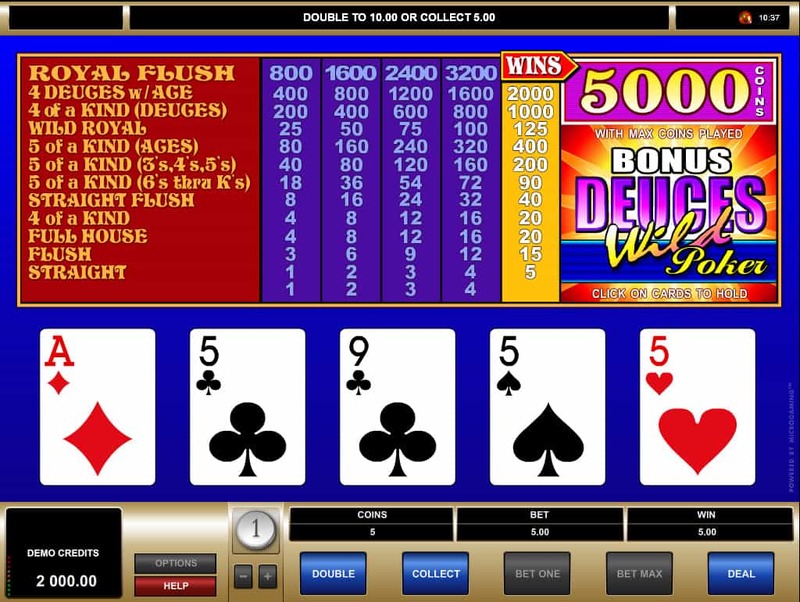 Okay, so Deuces Wild Power Poker’s release date explains it’s basic graphics. Our cards take centre stage at the bottom of our screens and, while they may be two dimensional, they are clear as day and bold as brass. The pay table sits directly above, flashing helpfully when we land winning hands. All of our winning hands are arranged in the pay table, flashing, too, when we land winners. Deuces - or twos - are Wild, substituting for all other cards. A clunky, dated computer sound effect accompanies drawing or holding our cards. This can be muted, though it does also add to the classic feel of the game. 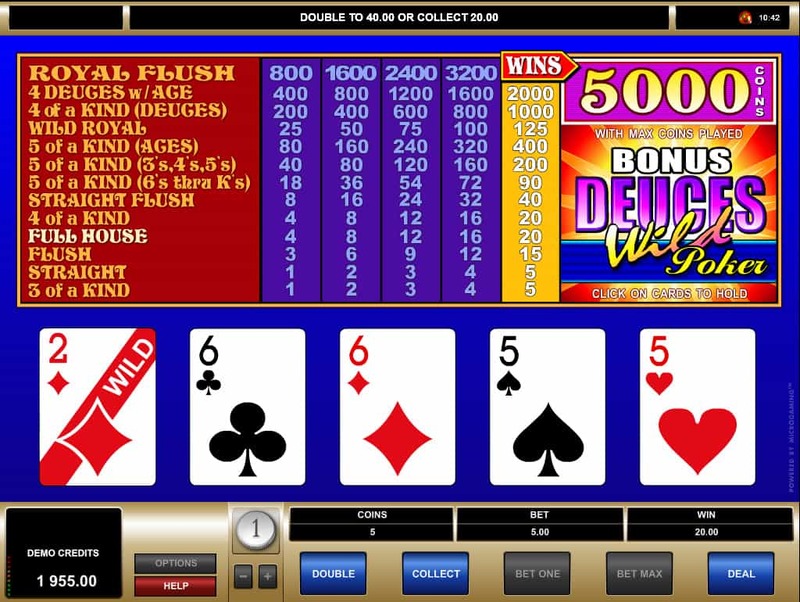 If there was any disappointment to be had in Deuces Wild Power Poker, it is that there is no real fanfare when we score a winning hand, even as tasty a run as Four of a Kind. We’ll just have to wait for the jackpot for that. 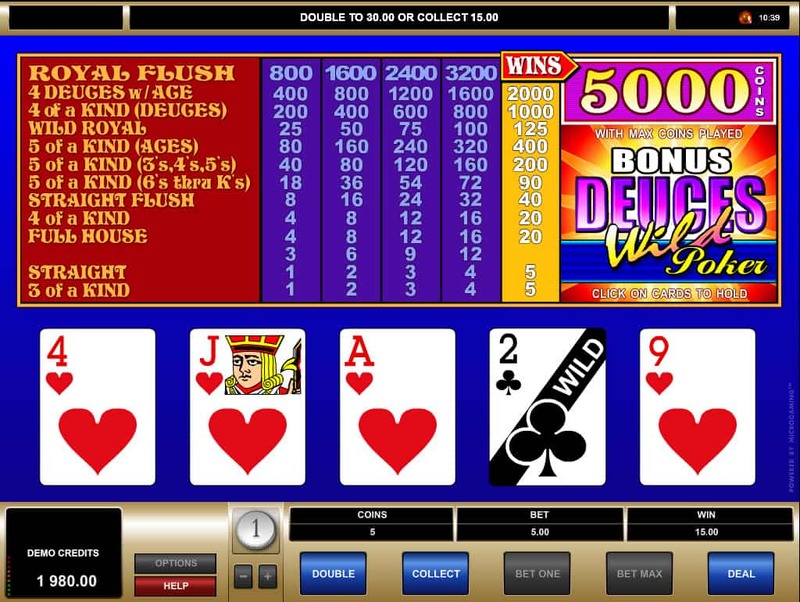 Deuces Wild Power Poker operates on a bet level and coin bet combination. The pay table shows off our bet level payouts, and we simply click on the pay table to raise or lower it. We adjust our coin bets using the toggle on our dashboard beneath the cards. Based on a five card draw game, we click “Deal” to receive five cards and can opt to hold any of these first five. Microgaming automatically holds those it recommends we hold - ideal for new players - but we can deselect these if we want to go maverick and for a preferred card combination. Hitting “Draw” holds any we have held and delivers the fresh remainder, hopefully returning with the cards to make up one of the classic winning poker hands in the pay table. If we are the gambling type - and, let’s face it, we could well be if we’re playing Deuces Wild Power Poker - we have the option to gamble each hand on a higher or lower card selection, doubling our winnings until we get one wrong. 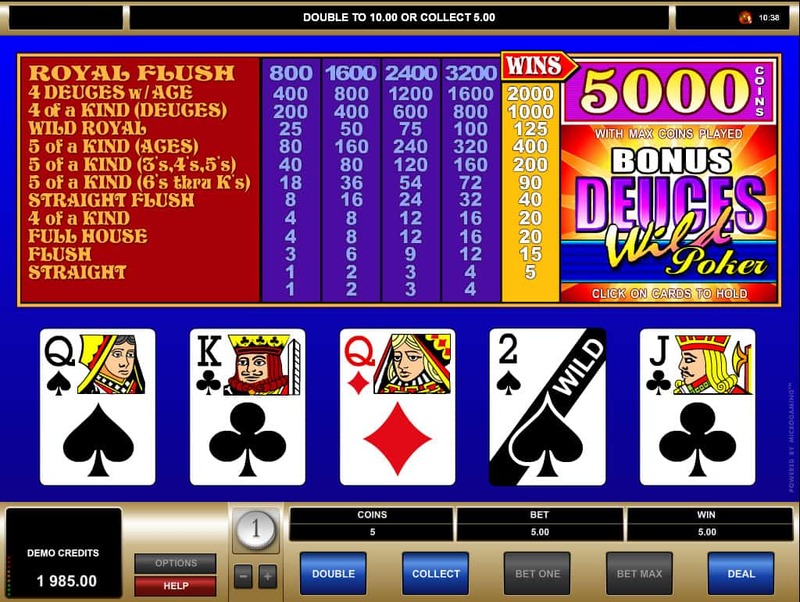 Sure it’s basic, but what Deuces Wild Power Poker lacks in hi-tech graphics it makes up for in sheer play-ability. The pace of the hands can be faster than a gunslinging Texan. If we want them to be, of course. The addition of the Gamble feature is also a useful one, offering up opportunities to up our RTP after every win. And who doesn’t want that?